Dr. R. Voll, a German allopathic physician, is known for his path breaking researches in Chinese acupuncture during the mid twentieth century. The western world had hitherto looked upon Chinese acupuncture therapy as an invalidated system and hence unscientific. Dr. Voll, with the help of electrical measuring instruments, demonstrated and validated the scientific base of various Chinese acupuncture points. He discovered eight new meridians on the palms and the feet to treat tissue disorders such as disorders of nervous tissues, skin tissues, fibrous tissues, etc. Dr. Voll also discovered a new eye meridian around the eye orbit to treat various disorders of the eyes. 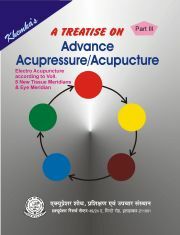 These new meridians are proving to be a boon to acupressure therapists to treat many hitherto incurable diseases. All these meridians and their points discovered by Dr. Voll are described in great detail in this book. Acupressure Natural Care System.ï¿½ 2010. All Rights Reserved.